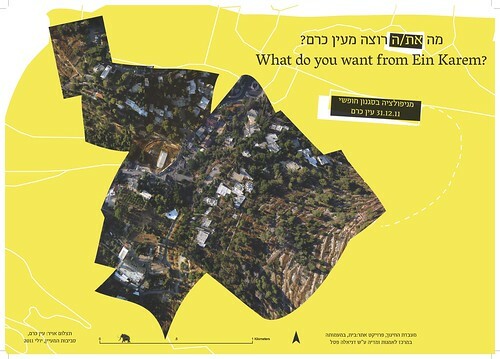 This DIY aerial photograph of the Miriam Spring area in Ein Karem was done following a two day kite mapping workshop we conducted, Shai Efrati and myself with Jeffrey Warren of the Public Laboratory, during July 2011, with children from Ein Karem, Jerusalem. Ein Karem was a Palestinian village prior to 1948, today it is one of the few places in Jerusalem which are still preserving the architecture and character of the Palestinian village. The Spring area is in the center of a struggle locals are running against plans to rebuild the area for commercial use. Those plans which are already in process of building are executed half illegally, not according to the permits given, creating irreversible damage in the valley. The locals, who are advocating for protecting the natural environment in the valley, claim that these renovation plans will seriously harm the spring and the water ways used in the ancient and recent agricultural lands in the valley. 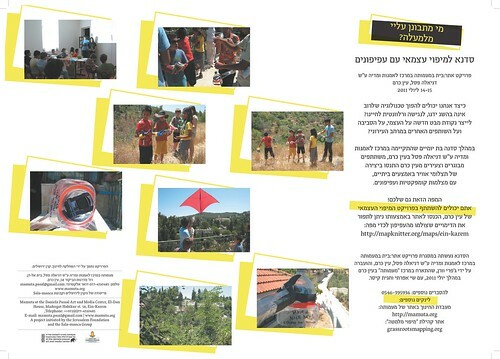 The workshop took place in Mamuta Art and Media Centre in Ein Karem, as part of the Education-Lab project. It was presented during December-March 2012 in the exhibition "the museum of the contemporary". 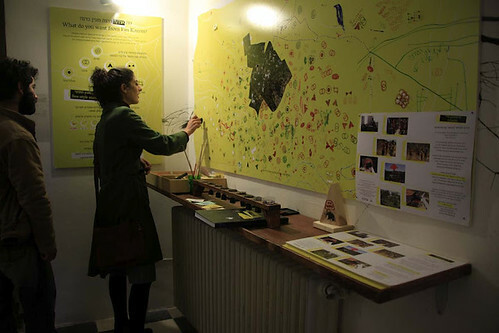 In the exhibition the map was titled "free style manipulation", we invited locals and visitors in the exhibition to edit the map by-hand, using rubber stamps, colors, notes, etc.